My mother was an *amazing* cook. She could make virtually anything – except pie crust and fried chicken! Her specialty was her soups, though. Most of them she came up with from scratch…just throwing in a bit of this and a dabble of that. I haven’t been able to find a single recipe written down anywhere! So, as a tribute to my mom – and a way to jumpstart my blogging – I present The Souper Challenge Blog Event! – Starting today, November 20th, post your favorite soup recipes. 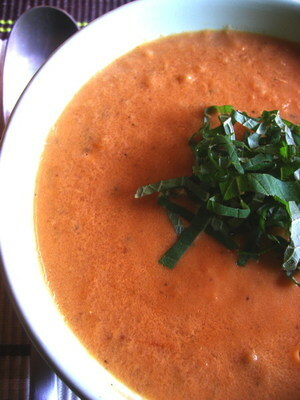 Soup is used very loosely here – stews, "stewps" (yes i said it – don’t look at me like that), chowders – they all count. – Recipes made for the holidays absolutely count! – Make your post before Friday, December 8th! Please send the following information to runningwithtweezers@gmail.com once you post your soup recipe: your name, your blog’s name, your location, and the permalink to your post. I will post the roundup shortly thereafter. – There is a prize at the end of this event. The judging panel of one – moi – will pick it’s favorite recipe based on tastyness, yummability, and style points. The winner will get a goody box of foodie-related stuff just in time for the holidays! Here is my soup recipe to get things started: Roasted Eggplant Soup. I love that this is a creamy soup without being overly so. Don’t pay attention to the notes on the recipe when it says it doesn’t need the cream at the finish. It does. Great roasted, smokey flavor and easily adaptable. This is a mildly seasoned soup, so feel free to go crazy with fresh herbs! Hi Tami, lovely theme of Soup . I like it. And will send you my entry very soon as my current post on my blog is a soup recipe. What a lovley tribute to your Mum Tami. Like you mother I make soup the same way. I bit of this and that and whatever I ancy that day. Tami, THANK YOU for taking my advice and posting this tribute to your gorgeous mother. Her talent and love of soups just bring her vibrantly into focus. Thank you, I am sure it would have pleased her. I am so IN for this event, I love soups as well. Matter of fact, I recently made one up — yes, much like your mother just tossing things in free form with no recipe to start, just an idea. With the blogging, I now take notes. I have lined up a post that will publish tomorrow, ironically! So, I’ll either submit that one or another if I make something else again between now and then. It’s great to be hearing from you again, thanks for the shout out too. Hi Tami! I can’t believe I’ve never come accross your blog until now. I’m so glad I finally did, you’ve got me hooked! This is a great idea and I can’t wait to get to work!! i’d love to participate in this event…hopefully i have enough time to make one! dang… i’m outta town for work! no time to post my roasted butter squash soup… i’ll join next time. I have e-mailed you the recipe, but here is the link, too. This sounds like such a fun event – sorry I didn’t find out about it sooner. The soup recipe that you shared sounds delish! Great pic too. Tami what a wonderful idea. I love soups and the biggest challenge will be in finding just the right one to send you. Hello, I was wondering if you would like to contribute a recipe to my new blog? Thank you, I hope you will consider contributing. THANK YOU for taking my advice and posting this tribute to your gorgeous mother. Her talent and love of soups just bring her vibrantly into focus. Thank you, I am sure it would have pleased her. Thanks. I love soups and the biggest challenge will be in finding just the right one to send you. Thanks. I’m outta town for work! no time to post my roasted butter squash soup. Thanks. I have created it as a place where anyone can come and publish their recipes.Good. Her talent and love of soups just bring her vibrantly into focus. Thank you. This sounds like such a fun event – sorry I didn’t find out about it sooner. The soup recipe that you shared sounds delish!……. This sounds like it is going to be a lot of fun!! !